Patrons of A Red Orchid's off-the-street theater are accustomed to scenery unfolding like pop-up puzzles on a shallow stage featuring only a little over a hundred square feet of walk-around floor space. Even so, the scenic design for Ethan Lipton's Red Handed Otter, set in a basement security center for an unnamed property (most likely a mall), may present its biggest technical challenge to date. "The script is unclear as to exactly what these lobster-shift guards are, well, guarding," says director Dado, "It just specifies a wall of TV screens showing parts of an empty building." Set designer Jim Moore adds, "Images of server-centers is where we got the idea of cages fashioned of steel grid with the monitors mounted on them. It provides boundaries, but also transparency." It also makes for a magnificently noisy punch-up later when Guy [Van Swearingen] and Luce [Metrius] throw each other up against them, after scattering surrounding objects helter-skelter. "Every time Guy and Luce crash into the CCTV monitors, we all cringe," Dado confesses, "Everybody, that is, but Jim, who reinforced it so that you could drive a forklift into it without doing any major damage. Of course, it also helps that David Woolley is a Wizard Fight Guy." The various pieces of the industrial decor also do double duty as the locales away from the workers' claustrophobic confines—for example, a brief rendezvous in an atrium, where what appears to be a lateral-file cabinet in the foreground is, reveals Moore, a conference table enclosed on the sides and resting on extra-tall legs to serve as a "garage" for a park bench. The boxed plants behind it are constructed "like a giant hinged clapper, with ivy panels and greenery attached (far superior to 'wood' fabrics that look like ugly 1970s couches under the lights and the eye-in-the-sky monitor footage)." The most elaborate ancillary environment, however, is the utility area that provides lovers a trysting place. Its introduction is partly facilitated by the Murphy-bed apparatus frequently employed in A Red Orchid plays, but unlike a flat mattress, the cable-and-counterweighted structure (dubbed by Moore, "The Drawbridge") conceals a diorama sporting such ambient accouterments as air ducts, electrical junction boxes, water and sewage pipes et al. "The only component that's really necessary to the scene's action turned out to be single chair, so we built the rest around it, being careful to mask the pulleys." How smoothly have all these functioned in performance? While stage manager Christa Van Baale reports the office furnishings—in particular, rolling elements like desk-chairs—sometimes veering off-course during the fight scene, Moore offers a more compelling caveat: "I was working alone one night and I'd left my phone out in the audience area, when I locked myself into the drawbridge. I was lucky to have brought a ladder with me that allowed me to just barely reach the latches. If I hadn't, I would have been stuck in there like a mummy until somebody else showed up with keys to the theater!" 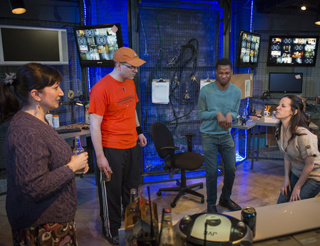 Red Handed Otter runs at A Red Orchid Theatre through May 24.